We stay here frequently when in the FL Panhandle. We like the little private beach (Sound side), pool, and love the swing! It has a tiki hut and pier. We have our own kayaks, but they do have a few kayaks and SUPs for rent. Not that we use them, however, the bathrooms are clean and well- maintained. It's close to Navarre Beach (just over the bridge), plus a good place for me to bike. Negatives are that the sites are somewhat cramped, not enough patio space, and constant sand at your door. The trees also drop some yucky something that gets all up on the awnings and roof. It remains a favorite for us despite any shortcomings. Stayed here for 4 nights. Loved this place. Has lots of charm. Nice pier. Lovely little places to take a picnic and have breakfast or lunch. Nice beach area with umbrellas. Will definitely return. We stayed here for 3 weeks. This is our home every time we are in the area. Peaceful park, private beach, nice pool, facilities are nice, and the staff are very accommodating. We had a special situation while we were there and Fran, the manager, was very nice to work with us. Nearby restaurants and grocery stores, and of course the main beach is just over the bridge... Not too touristy but it has grown in recent years. CrossFit Navarre is 4 miles away and I love the friends I've made there. Plus good biking over the bridge to Pensacola. Very reasonable rates. 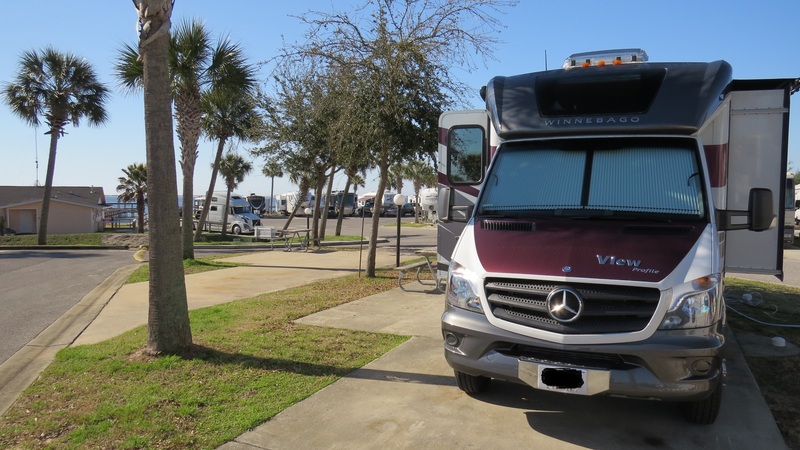 Emerald Beach RV Park is one of our favorite places to visit. We initially went there for 4 days over Spring Break to get out of our harsh Winter. We loved it so much, we made plans to return for the entire summer. The staff are very friendly and accommodating. The sites are nice, not huge but room enough. We loved the private beach area, the pier, the pool, and the swing. We were there over the 4th of July and you could see the fireworks from the private beach, plus the campground had a band and activities in the rec hall. The campground is also conveniently located between Destin and Pensecola. I am a cyclist, so I would go over the bridge and cycle all the way to Pensecola and back. There's not much traffic on that road and it is only 40 mph most of the way because of the protected bird area. I also found an excellent Crossfit Gym, Crossfit Navarre, not too far away. I met a lot of really nice people at the gym and in the campground that have become life long friends. The rates are very reasonable when compared to other beach RV parks, and there are some nice restaurants in the area. We especially recommend East River BBQ. I hope you enjoy your stay as much as we did! Extremely clean park. Friendly staff. Very busy... Reserve early. We wanted to stay a week, but could only get 3 nights. Roads and pads paved. Great place. 45 minutes from pensacola NAS. This is a great park on the bay side. It has a great layout and easy to set up. The staff is fantastic. I hope to come annually. I can see why this park is on the Best Parks in America list for the last 2 years. The park and sites are easy to get in/out of, the sites are concrete with grassy yards and the hook ups are good with good water pressure. We stayed 1 night in a centrally located pull thru and finished our week in a waterfront, having experienced both I can say I don't think there is a "bad" site in the park. The staff were friendly and helpful, the bath and showers were clean and they have outdoor showers located at both beach entrances. We camped in a fifth wheel and can't wait to go back. We stayed at Emerald for a whole week with four teenagers and my husband and I. We loved the park. We had the site on the beach. It was amazing. Plan on staying there again next year and years to come. We took one of the sites next to the beach, very clean and well maintained park, nice beach and lovely sand.